Having read through the first quarter of the reading year, how are your stacks? Is the bedside stack turning over regularly? Are you struggling to stick with projects that you were sure would fit perfectly into 2016? 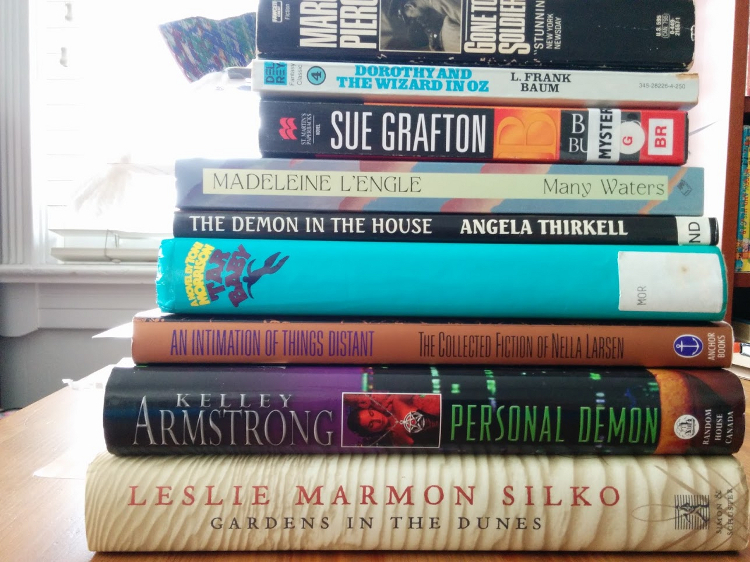 Four books in this stack are from various TBR lists, some because they are older works by favourite authors (like Toni Morrison) and others because a bookfriend sang their praises loudly (like Leslie Marmon Silko). Both authors are challenging for me. The prose is beautiful – sometimes so beautiful that I have to read it aloud to catch the beauty, otherwise it swells and whirls and overwhelms and I get stuck. That happened to me with my last reading of Toni Morrison, The Song of Solomon. I began it three times, read large sections of it aloud, and took months to complete. None of which even begins to touch my experience of reading Beloved. I began reading it 16 years ago and I haven’t finished yet. Normally I wouldn’t consider that a read in-progress, but I am still haunted by the half of the book which I did read. This unfinished story is one which I recall more vividly than many books I have begun and finished long since. My bookmark remains in it, still, and enough time has passed to make me all-the-more anxious about completing, because obviously some of the most troubling parts of the story remain in my reader’s memory. Tar Baby stands between Beloved and me now. I wonder how many years I could spend with Tar Baby in my stack. Nella Larsen’s volume of collected works, An Intimation of Things Past, with an introduction by Marita Golden, is challenging in a different way. In some ways, t is a terrific companion to Edith Wharton’s The House of Mirth, which I read recently. And it also fits with some of the stories in Langston Hughes’ The Ways of White Folks. Her shorter stories are often striking (sometimes startlingly sad), and I am torn between wanting to finish and wanting to spin them out. Marge Piercy’s Gone to Soldiers took a long time to settle into my stack. The large cast of characters was difficult to hold in my mind (with so many other books in my stack especially) and it took awhile to understand that sometimes it is more about capturing a mood and a trend than about specific details and individual experiences. Most of the characters are depicted on the home front during WWII, but eventually some characters participate in military conflict, which rounds out the historical picture (from a North American and European perspective). I knew the time and geographic locations provided connections between chapters (I’ve tried to read this one before – this is my year for completing previously abandoned projects!) but now that I’m a couple hundred pages into the story, I recognize there are more deliberate connections between characters as well (siblings, neighbours, etc.). It is interesting, but the tiny type means it spends more time in the stack than it spends in my grip. There are five volumes from five different series in my current stack, but I’ll chat about those another time. Are there elements of your reading stack which seem to demand their own conversation? Is there something in your stack which you are simultaneously drawn to and yet are reluctant to read? Are there other bookish contradictions preoccupying your reading mind these days? You’ve captured my thoughts about Beloved exactly! I got halfway through about five years ago, and I haven’t picked it up again. I still think about the parts I read often, yet for some reason I haven’t been able to go back to it. Maybe this is the time to do so! What’s remarkable about this is how much the unread (portion of the) book is almost as powerful as the read: I’m not sure I’ve ever had this kind of experience with another book. I’m also not sure what (if anything) it means! But I am enjoying all of it, which is the main thing. Right now I have both King Leary and Hangman’s Beach on the go. I have to admit that I started Hangman’s Beach because I’m having trouble getting into King Leary. Maybe because all the characters are hockey players, and I don’t care much about hockey? Ha! It is good, though. And funny. Just not gripping. How’s the Raddell going? I made a couple of attempts with TN&TL many years ago, but didn’t get too far. I thought I had a copy of King Leary at hand, but I do not; I’ve been meaning to read that one for aaaaaages. Maybe it’ll pick up for you as you get to know the guys? As I said before, King Leary did pick up for me, and I ended up really enjoying it! I have loved both of the Raddall books that I’ve read now. Hangman’s Beach is full of interesting history of Halifax and area during the Napoleonic wars. I was explaining it all to my husband as I went, because he grew up in Halifax, but he didn’t really know about any of it. I’ve been seriously thinking about seriously reading more East Coast authors, more seriously systematically. There are so many on my list of faves already that I’m certain I am overlooking some gems. I’ve always felt like an East Coast girl at heart and even here in Ontario I love the rocky and watery parts most. Raddall is back on my list now! I have a terrible time finishing Toni Morrison, too. I’m so relieved that it’s not just me.